Welcome To Sanctuary Golf Club! 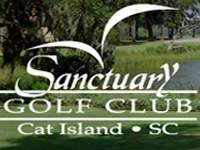 Sanctuary Golf Club at Cat Island is a most beautiful, nature-filled location for recreation, memorable events or just relaxing with friends, family and entertaining business associates. Tucked away in a stunning and tranquil setting steeped in history near the shore, Sanctuary Golf Club features award-winning golf & tennis. In Beaufort, golf is a way of life. With dozens of world-class courses, public links and championship layouts located within a one-hour radius, the area serves as a paradise for golfers. Golf packages, tee times and golf discounts are available throughout the year, offering the opportunity to tee off on some of the Southeast’s finest courses. Great Shots from the Three Toughest Lies in Golf!